Do you have a vehicle manufactured before 1996? Chances are that your vehicle is an OBD1 compliant vehicle. But what exactly is one of the best OBD1 scanners? To put it in the simplest way possible, an OBD1 scanner often works for one specific make of car. Unlike the OBD2 scanners, OBD1 scanners are not standardized across different manufacturers. For instance, an OBD1 scanner that can diagnose a Toyota make will not diagnose a make from Ford. The difference between an OBD1 and OBD2 also extends to the kind of retrieved diagnostic trouble codes. You will observe that if a Toyota and Ford have the same engine faults, OBD1 scanners will retrieve different diagnostic trouble codes. 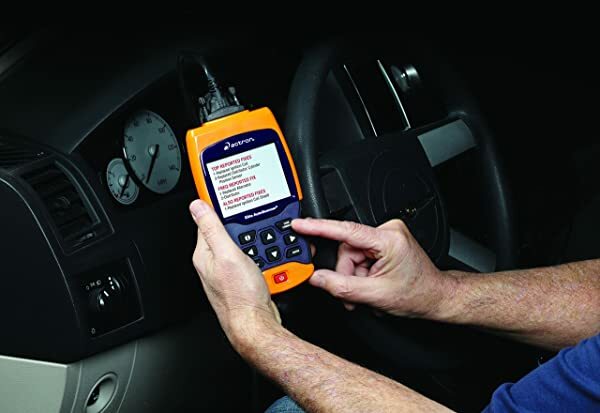 In this review, we have featured 5 best OBD1 diagnostic scanners. The first two scanners are exclusively OBD1 scanners. The three other scanners are OBD1/OBD2 diagnostic scanners. Luckily, if you have an OBD1 compliant vehicle you can choose any of the scanners. The scanner will work well with your car. We have also picked the top three scanners to make the process of picking the best OBD1 scanner is much easier for you. There is also a comparative table that summarizes and compare all the five scanners. Are you tired of counting flashes while diagnosing your OBDI compliant vehicle? If so, then you need the Innova 3145 code reader. This scanner has a digital display designed to show numeric DTCS instead of flashes. This scanner has a digital display designed to show numeric DTCS instead of flashes. It is a big relieve as you won’t have to count the flashes in order to identify a diagnostic trouble code. 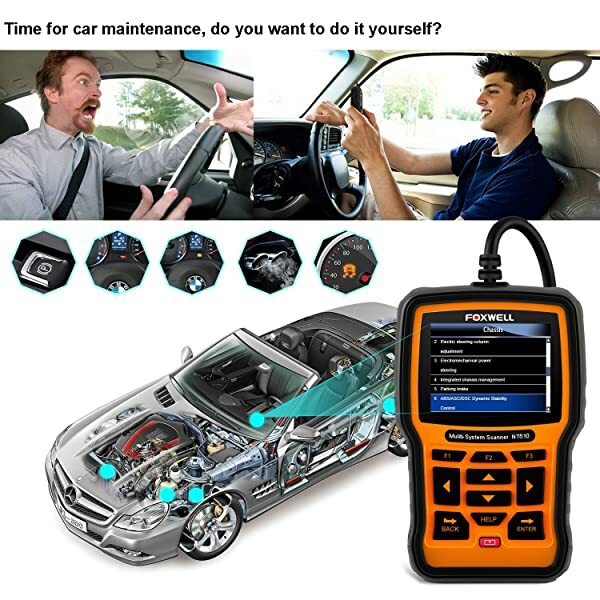 All you need to do is connect the scanner to the onboard computer and directly read the diagnostic trouble code from LCD screen. Once you have retrieved a DTC, use the manual to interpret it. If you find that the points to a minor issue, then you can fix it if you are a DIY. However, if you are dealing with an advanced issue you can take your car to a mechanic. Getting to know the cause of a fault before taking your car to a mechanic can help you estimate the cost of repair. Innova 3145 will help you to clear the check engine light once the fault has been fixed. Besides, this code reader can help you to test the Cylinder, KOER, KOEO, as well as perform relay tests. The best part is that the manual has clearly elaborated procedures on how to perform each of these tests. Innova 3145 works on most trucks and cars from GM manufactured from 1982 to 1995. You will be able to diagnose vehicles such as Lincoln, Ford, and mercury all being domestic trucks and cars. Besides, Innova 3145 is compatible with EEC-IV and MCU computer control onboard systems. This code reader is designed for car owners who want to diagnose OBD1 compliant vehicles. Innova 3123 is an OBD1 scanner that will give you the value of your money. You will notice that it is designed to work mostly on GM vehicles. The scanner will accurately access your vehicle’s onboard computer to retrieve diagnostic trouble codes. If the check engine light is on, then you can bank on this scanner to turn it off. You will find that this OBD1 scanner can read the engine (ECM). If you find that your car is experiencing performance issues such as a timing that is off or reduction in fuel efficiency, then Innova 3123 can help you to diagnose your car. Worse still, if your car fails to start up, you can use this scanner to diagnose the engine. Innova 3123 can also help you to diagnose and resolve issues surrounding the ABS system. You will be able to know if the wheel sensors are faulty and need to be replaced. This will help you to resolve issues that may cause the wheels to lock up when braking. Better yet, Innova 3123 is delivered with a guidebook that has the definitions of all DTCs. Once you have the interpretation of the DTC you can go ahead and repair your car if you are a DIY. You can also choose to take the vehicle to a mechanic. The good news is that you already know the underlying issue and therefore will not be overcharged by your mechanic. Innova 3123 is compatible with most of the vehicles from GM. These vehicles are manufactured from 1982 to 1995. Besides, Innova 3123 is compatible with MCU computer control onboard systems. This code reader is basically designed for ordinary car owners who want to diagnose OBD 1 compliant vehicles. If you own either an OBD1 OR OBD 2 compliant BMW then check out FOXWELL NT510. This scanner is a BMW-only diagnostic scanner. You will be able to read code from most BMW manufactured from 1987 to date. If you own either an OBD1 or OBD 2 compliant BMW then check out FOXWELL NT510. This scanner is a BMW-only diagnostic scanner. You will be able to read code from most BMW manufactured from 1987 to date. 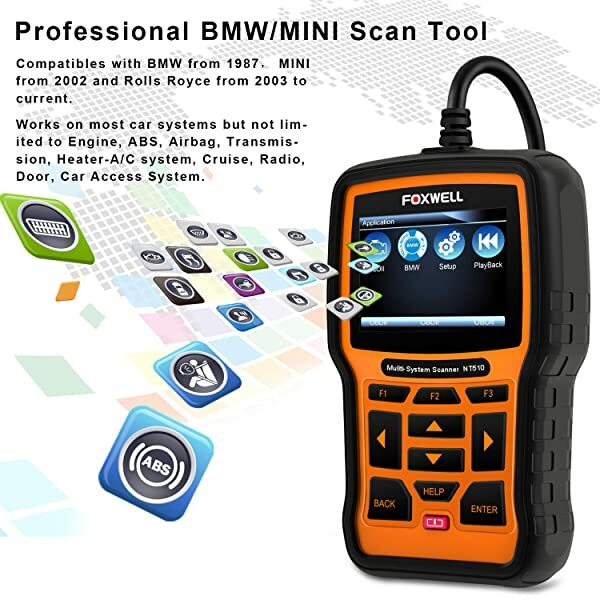 FOXWELL NT510 is a BMW diagnostic scanner. 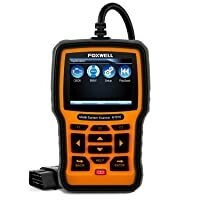 FOXWELL NT510 has amazing diagnostic capabilities. To begin with, it can read as well as clear DTCs from major BMW systems. These systems include transmission, engine, airbag, ABS, DISA, and SAS. You will realize that the scanner will automatically identify your vehicle and subsequently run tests on all modules checking for error codes. It also performs resets functions on various monitors as well as triggering windows, lights and brake caliper test and opening. This OBD2/ OBD1 scanner supports a number of special functions. The special functions include the activation of the ABS module, deactivation of the brakes, oil light lamp reset, battery registration, and adjustment of the throttle body. Other special functions that you can perform with this scanner include CBS condition-based reset as well as DPF regeneration. You will also be able to perform an active test using this scanner. Besides, it can temporarily start as well as control all the system in your car for active testing. As a result, you will end up with more accurate results and eventually draw better diagnostic conclusions. FOXWELL NT510 is also an OBD1 and OBD 2 scanner. It works on BMW models manufactured from 1987 to date. This is built for professional tech and mechanics who are involved in a regular diagnosis of BMW vehicles. Actron CP9690 diagnostic scanner comes with OBD1 as well as OBD2 cables. As a result, you will be able to perform both basic and most of the advanced functions on both OBD1 and OBD2 vehicles. Actron CP9690 diagnostic scanner comes with OBD1 as well as OBD2 cables. As a result, you will be able to perform both basic and most of the advanced functions on both OBD1 and OBD2 vehicles. You will be able to read and clear the check engine light using this diagnostic scanner. The most outstanding special functions that you can perform using this tool include engine, airbag, and ABS functions. The scanner allows you to diagnose and resolve most of the engine performance issues. Once the issues have been resolved you can use the scanner to clear the check engine light. Equally, this scanner will help you to resolve underlying ABS issues and eliminate the chance of the wheels locking while braking. And when you notice that the airbag light is on you can use this scanner to retrieve SRS trouble codes. This will eliminate any chance of the airbag deploying without being triggered by a crash. CodeConnect is another notable feature envisaged in Actron CP9690 scanner. The feature connects you to over 26 million repair procedures, therefore, making it possible for you to resolve even the seemingly complex repair problems. Actron CP9690 is compatible with OBD1 compliant GM, Chrysler, Ford, and Toyota vehicles made from 1984 to 1995. It is also compatible with OBD2 Toyota, Hyundai, Nissan, Honda, Chrysler, Hyundai, and Ford vehicles manufactured from 1996 to 2013. Actron CP9690 is also compatible with windows software. This diagnostic scan tool can effectively serve both professional tech as well as ordinary car owners. 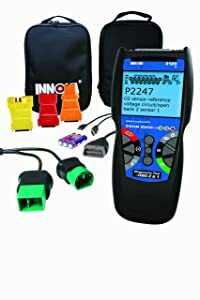 INNOVA diagnostic scan tools are designed with high quality and INNOVA 3120 is not an exception. You will be able to scan most OBD 2 compliant vehicles that are made in the USA from 1996. INNOVA diagnostic scan tools are designed with high quality and INNOVA 3120 is not an exception. You will be able to scan most OBD 2 compliant vehicles that are made in the USA from 1996. These OBD2 compliant models include light-duty trucks, SUVs, as well as cars. 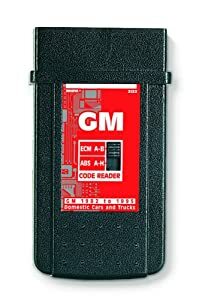 At the same time, this scanner works on most OBD1 vehicles manufactured from 1983 to 1995. However, these vehicles should have an EEC-IV system that includes the KOER and KOEO system. INNOVA 3120 is capable of reading and erasing transmission, engine, and ABS codes. You will be able to erase the check engine light using the scanner after resolving the underlying engine issues. You will also observe that the scanner keep refreshing after 30 seconds. This makes it ideal for ongoing repairs as well as clearing ABS, MIL, and transmission light in real time. Besides, the device also allows you to retrieve data even when you have switched off your vehicle. This is because it has a battery that helps it to sustain backup data. INNOVA 3120 works on OBD1 vehicles that are manufactured from 1982 to 1995. It also works on most of the OBD2 compliant models manufactured from 1982 to 1995. INNOVA 3120 is ideal for DIY. It can also be used comfortably by average car owners as well as mechanics. You will find that these OBD1 scanners have strength as well as the downsides. However, there are some scanners that have more strength than others. 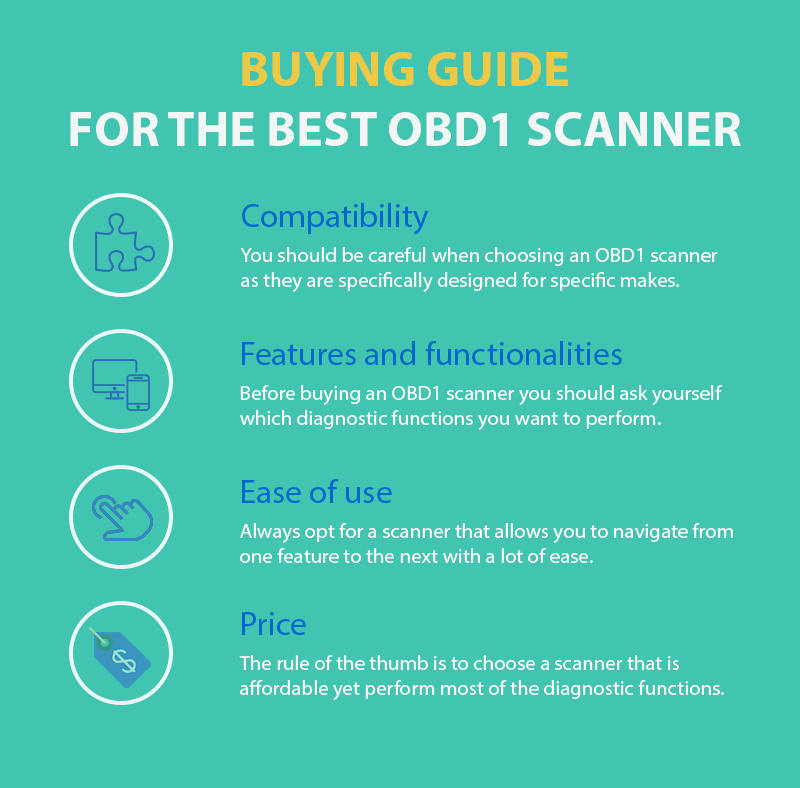 This scanner is ideal for all the individuals who are on a budget. It will cost you less than $20 to get one. However, your vehicle should be GM. This is yet another great scanner because it has comprehensive functionality. The scanner can perform most of the diagnostic functions on BMW. You will be able to undertake functions such as transmission, engine, airbag, ABS, DISA, and SAS. The scanner covers both OBD1/OBD2 vehicles yet is competitively priced. It also supports advanced functions such as airbag and ABS. Diagnosing a vehicle that was made between 1982 to 1995 requires you to use an OBD1 scanner. Fortunately, you will be able to find an OBD1 scanner that is designed to diagnose specific brands of vehicles. The best part is the OBD1 scanners are affordable. Buying guide for the best obd1 scanner. The first factor to consider when buying an OBD1 scanner is compatibility. You should be careful when choosing an OBD1 scanner as they are specifically designed for specific makes. Before buying an OBD1 diagnostic scanner you should ask yourself which diagnostic functions you want to perform. If you are a professional tech or a mechanic then you should choose an OBD1 scanner that can perform many diagnostic functions. However, if you are an ordinary car owner then you can choose a scanner that covers basic diagnostic functions. Buying a diagnostic scanner that can is difficult to use or have complex and advanced functions at times may not of any benefit. Always opt for a scanner that allows you to navigate from one feature to the next with a lot of ease. Also, the scanner should allow you to easily read and erase diagnostic codes. Different OBD1 diagnostic scanners are differently priced. The rule of the thumb is to choose a scanner that is affordable yet perform most of the diagnostic functions. After reading the article I am still unclear which Scan tool is appropriate for my 1993 Nissan Maxima. I recommend you also read more about compatibility you will find your need.